Arsenal star Thierry Henry has announced his retirement from professional football after playing wonderful years at several top clubs. The former Gunner was expected to join another side after he left New York Bull, but the Frenchman decided to announce his retirement. 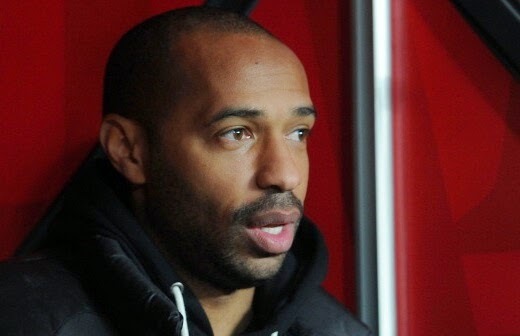 The former Barcelona striker Henry has decided to join Graeme Souness, Gary Neville, Jamie Redknapp and Jamie Carragher on Skysports pundit board as he said that he will join Skysports to give his analysis. The 37-year-old was also expected to be a part of Arsenal after the retirement but he made it clear that he wants to be a pundit and wants to join the above group of wonderful experts. He played 792 games in his entire football career for five top sides, AS Monaco (France), Juventus (Italy), Arsenal (England), Barcelona (Spain) and New York Red Bulls (USA). The all-time Arsenal top scorer played his best days in England before leaving them for Barcelona. He did not only prove at club level, he also helped his country to win the World Cup in 1998. He scored 51 goals in 123 appearances for his country France. Arsenal: Premier League (2), FA Cup (3). Barcelona: La Liga (2), Copa del Rey, Supercopa de España, UEFA Champions League, UEFA Super Cup and FIFA Club World Cup. New York Red Bulls: MLS Supporters' Shield, MLS Eastern Conference (2). France: FIFA World Cup (1998), UEFA European Football Championship (2000) and FIFA Confederations Cup (2003).